If you're looking for some new shrubs and want strong color contrasts in your garden, choosing plants that combine yellow and green can be effective. Many shrubs have variegated leaves that mix yellow and green, including deciduous plants as well as both broad-leaf and needled evergreens. Other shrubs have yellow flowers that stand out strongly against bright green leaves. In addition to acting as focal points during the growing season, evergreens keep their foliage and stay interesting all year. Quite a few needled evergreens mix yellow and green, including several yew cultivars (Taxus spp.). 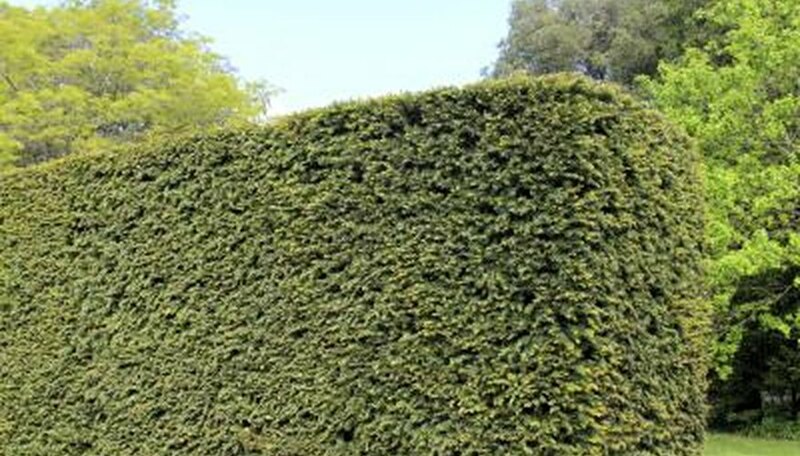 For example, a variety called "Standishii" (Taxus baccata "Standishii") is a slow-growing, narrow, conical shrub that grows 4 or 5 feet tall and only 1 or 2 feet wide. Its green foliage is distinctly yellow-tipped, with more yellow appearing when it's grown in a sunny spot. "Standishii" grows in U.S. Department of Agriculture plant hardiness zones 7 through 8. The golden threadleaf false cypress (Chamaecyparis pisifera "Filifera Aurea") is another evergreen that can grow up to 20 feet tall, has threadlike needles on drooping branches and grows in USDA zones 4 through 7. Green needles cover shaded portions of the plant, while needles on parts in the sun turn a bright, golden yellow, making a dramatic contrast. Leafy plants that keep their leaves all year, broad-leaf evergreens can also bring yellow and green contrasts to the garden. 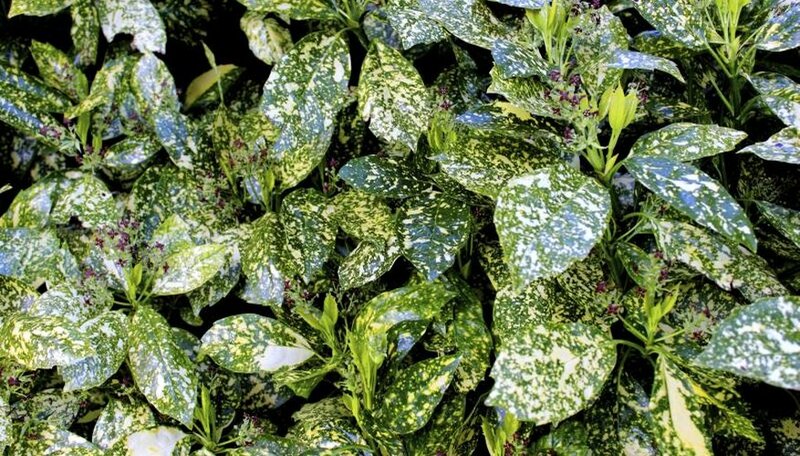 The gold dust plant (Aucuba japonica "Variegata") is a good example and it grows in USDA zones 6 through 10. Named for the spattering of small yellow spots that cover its shiny, flat, dark green leaves like bright dust, it can grow 6 to 10 feet tall, with an equal spread. 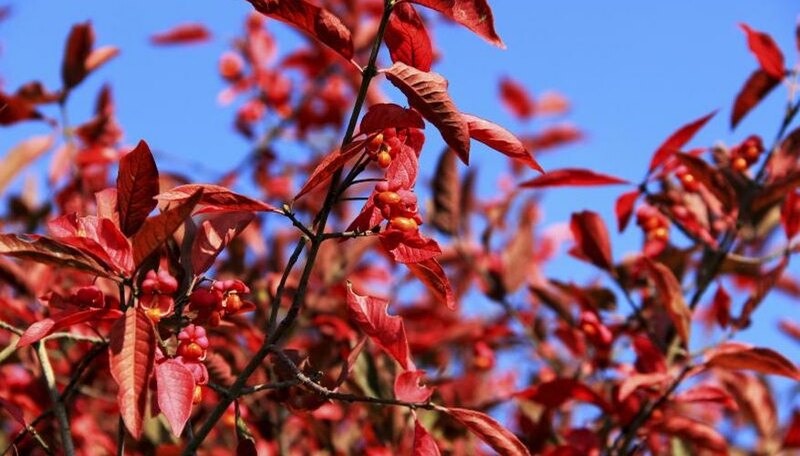 Its leaves are poisonous, so don't plant it in where children or pets play. 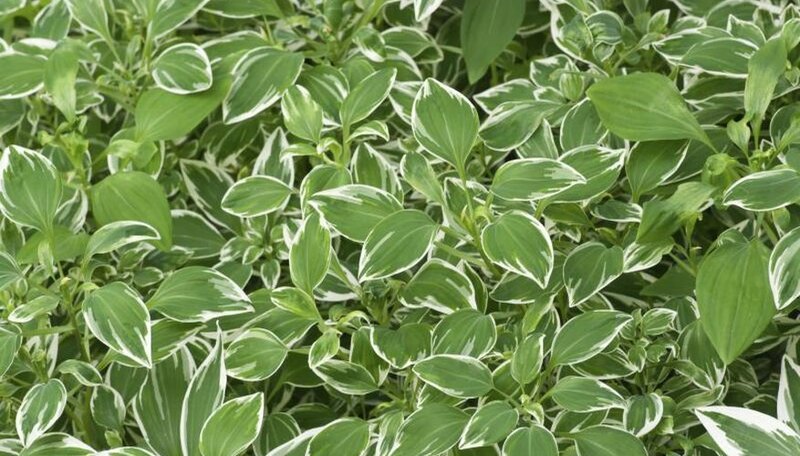 For a yellow and green shrub that's low-growing and spreads, the euonymus variety called "Emerald 'n' Gold" (Euonymus fortunei "Emerald 'n' Gold") grows only 1 to 2 feet tall and spreads over an area 4 feet wide. It forms a dense mat of glossy, dark green leaves edged in bright gold and grows in USDA zones 5 through 8. Some deciduous shrubs combine yellow with green during the growing season, sometimes with other colors in the mix. For example, the viburnum cultivar "Variegata" (Viburnum lantana "Variegata") has large, flat green leaves splashed with blotches of both yellow and cream. It has clusters of creamy-white flowers to add interest in late spring, followed by red berry clusters in summer that turn black in fall, and grows in USDA zones 3 through 7. Black elder "Madonna" (Sambucus nigra "Madonna") is another deciduous shrub with yellow and green accents that reaches 6 to 10 feet tall, with an equal spread, and grows slowly in sun or partial shade. Its colorful leaves are a bright green splashed with golden yellow, accented by clusters of white flowers that are followed by small black fruits. You can also bring yellow and green into your yard by choosing green-leaved shrubs that produce yellow flowers. 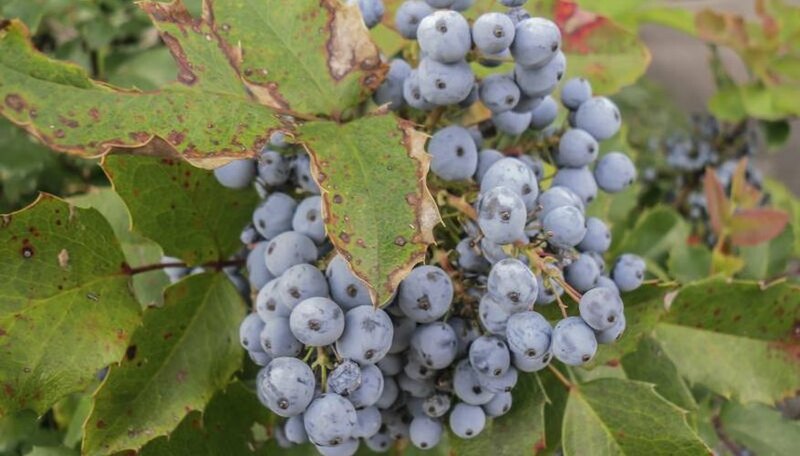 For an attractive, broad-leaf evergreen, few shrubs top Oregon grape-holly (Mahonia aquifolium), with its glossy, dark green leaves on a bush that's 3 to 6 feet tall. In spring, it covers itself in clusters of deep yellow flowers that last for several weeks, making an attractive display. Oregon grape holly grows in USDA zones 5 through 8. The butterfly bush cultivar "Sungold" (Buddleia x weyeriana "Sungold) is another yellow-flowered shrub that's deciduous and grows 4 to 8 feet tall and wide. It has deep yellow, elongated blossom clusters in summer, making a good contrast against its blue-green leaves. It attracts butterflies and grows in USDA zones 6 through 10. North Carolina State University Cooperative Extension: Chamaecyparis Pisifera "Filifera Aurea"
Missouri Botanical Garden: Euonymus Fortunei "Emerald 'N' Gold"
Lakeland Nursery: Viburnum Lantana "Variegata"
National Gardening Association: Buddleia x Weyeriana "Sungold"